For the past 16 years, Lar Culleton and his wife Margaret have been providing a top-class milk collection and delivery service for Glanbia. Their fleet of eight trucks collects over one million litres of raw milk from 340 dairy farms in counties Carlow, Wicklow and Kilkenny each year. Based in Ballymurphy, Borris, Co. Carlow, Culleton Transport became a limited company in 2006, having operated as a sole trader for four years prior to that. These days Lar and Margaret are helped in the day to day running of the business by their son Laurence. Since starting the business in 2002, Lar has taken on a number of milk collection runs spanning three counties. His eight-strong fleet of bulk collection vehicles cover an area from Graiguenamanagh, Co. Kilkenny to Enniskerry, Co. Wicklow, and from Arklow, Co. Wicklow back across to Bagenalstown and Ballon in Co. Carlow. Following the abolition of the milk quota, Lar and the team have seen their workload increase considerably and they have gone from collecting from 293 farms two years ago, to 340 now. The milk is delivered to Glanbia’s dairy processing facilities in Ballyragget, Co. Kilkenny, Wexford, Virginia, Co. Cavan and Belview, Co. Kilkenny. The new state-of-the-art Belview facility, which is located on the Kilkenny-Waterford border, is the largest single infrastructure investment in Ireland by an indigenous company since the construction of Ardnacrusha on the River Shannon in 1929. Margaret revealed that they are busier than ever and that is why they added to the fleet of trucks. “We are very busy. We now have nine trucks on the road. 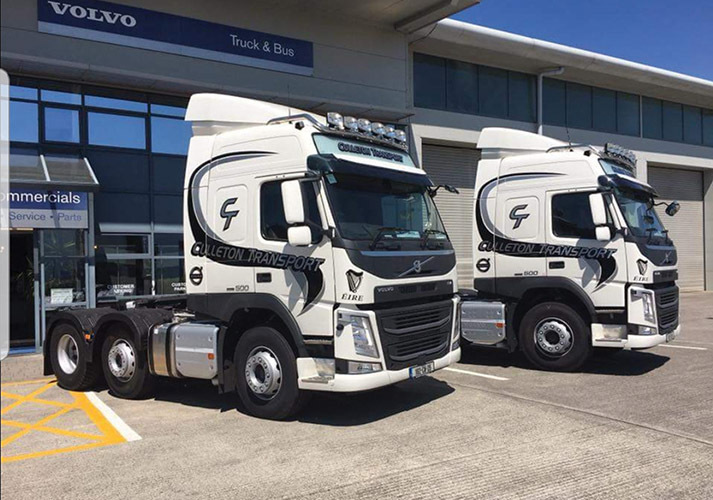 Recently, we bought two new Volvos from McCarthy Commercials and a Scania from K.D Garage in Wexford,” said Margaret. “The fleet now consists of four Scanias and four Volvos. The new trucks have had our personalised signage put on them by J&J Services in Carlow and they did a great job. Margaret stated that the abolishing of the milk quota has made a massive difference to their workload as they are busy all year round now. The trucks pull six high-tech collection tankers, which are supplied by Glanbia and bear the Glanbia livery. The bulk tankers are designed to reduce milk collection times on farm and automate the secure transfer of information needed to pay farmers for the milk collected. The tankers boast state-of-the-art technologies such as GPS supplier recognition, data transfer by satellite and GSM. They are equipped to pump up to 57,000 litres of milk per hour, reducing collection time on farm and allowing for a more efficient operation overall. While Glanbia maintain the tankers themselves, the trucks are maintained and serviced by Laurence who is a qualified mechanic who served his time with Pender’s Garage in Bunclody, Co. Wexford. For bigger repairs, the trucks are sent to either KD (Garage) Services or McCarthy Commercials in Kilkenny. Culleton Transport employs seven full-time drivers and 15 at peak times. It goes without saying the drivers are highly-skilled, efficient, reliable and courteous. “Many of the drivers are with us years at this stage, most of them would be here 13 or 14 years at this stage. They are good lads that know their job inside out and are on good terms with the farmers which is important. The Culleton’s are also proud to be associated with one of Ireland’s biggest and most successful companies. With deep roots in the dairy industry, Glanbia has a turnover of over €3.5 billion per annum, almost 6,000 employees and a presence in 34 countries worldwide. Its vision is to be one of the world’s top performing nutrition companies, trusted to enrich lives every day. Culleton Transport has developed and expanded by providing a professional, prompt and friendly service. Through ongoing investment and training, it has certainly come a long way in a little over a decade. Tinnecarrig, Ballymurphy, Borris, Co. Carlow.